I can’t get enough of Stampin’ Up!s Dear Doily Bundle! From the flowers to the gorgeous doilies, I don’t know which I love most! The combination of colours I’ve used on my flowers are Petal Pink and Smoky Slate. I then added some Basic Gray to the tips of the flowers to make them stand out a little more. The matching die to these flowers makes it a breeze to cut them out and place on my card. My flowers are colours by applying the markers directly to my stamp, huff on them with my breath and then stamp them on Whisper White Cardstock. I had some off cut pieces of Smoky Slate DSP and Whisper White Cardstock sitting on my desk, so they ended up being layered under my flowers. The sentiment I’ve used on my card is from Tropical Chic. 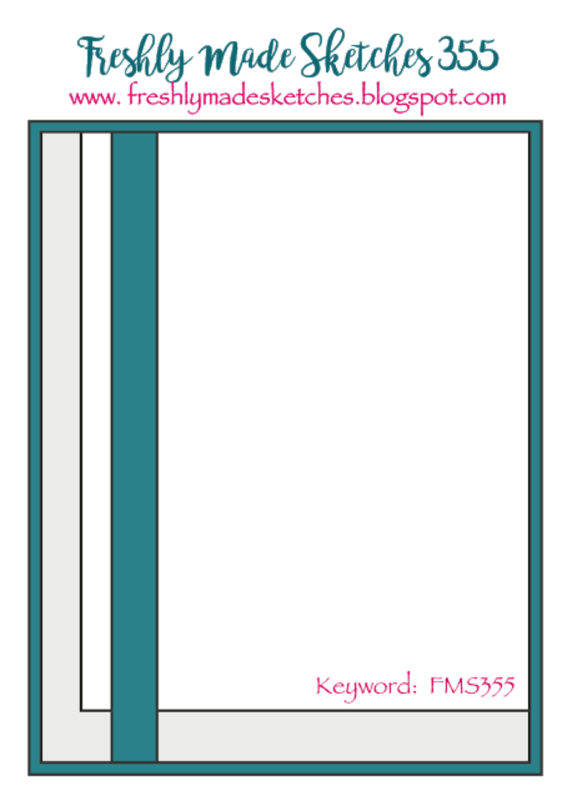 I haven’t used this one in a while, but I love how it fits across the card and has the mixture of fonts. I then cut a strip of Basic Gray Cardstock that has been cut with the edgelit type die. I place this under my sentiment. The doily that I have used on my card is stamped in Flirty Flamingo Ink and then fussy cut out. I then added a strip of White Burlap Ribbon and an Artisan Pearl to finish my card off. The talented team at Freshly Made Sketches have created gorgeous cards with my sketch. Pop over to the challenge and see what they’ve created. I can’t wait to see what you’ve created. 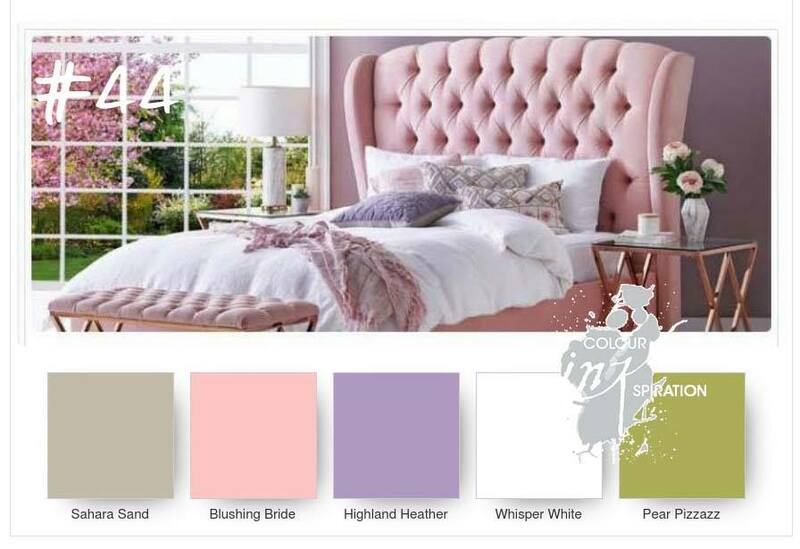 These colours sang feminine floral to me as soon as clicked on them in our facebook group. One of the other reasons I went with flowers was because I have no bed stamp set……. My flowers are from Happy Birthday Gorgeous. I’ve stamped the outline stamp with Black Stazon Ink. This stamp set has a solid stamp to colour the centre of the flowers. It’s a great set for new stampers who aren’t confident in colouring with watercolour pencils for pens. For the centre I’ve stamped Blushing Bride Ink and three coats of Highland Heather Ink to give me a darker shade of purple. The leaves are stamped in Pear Pizzazz Ink – these leaves are from Tropical Chic. The little solid black stems are also from Happy Birthday Gorgeous. 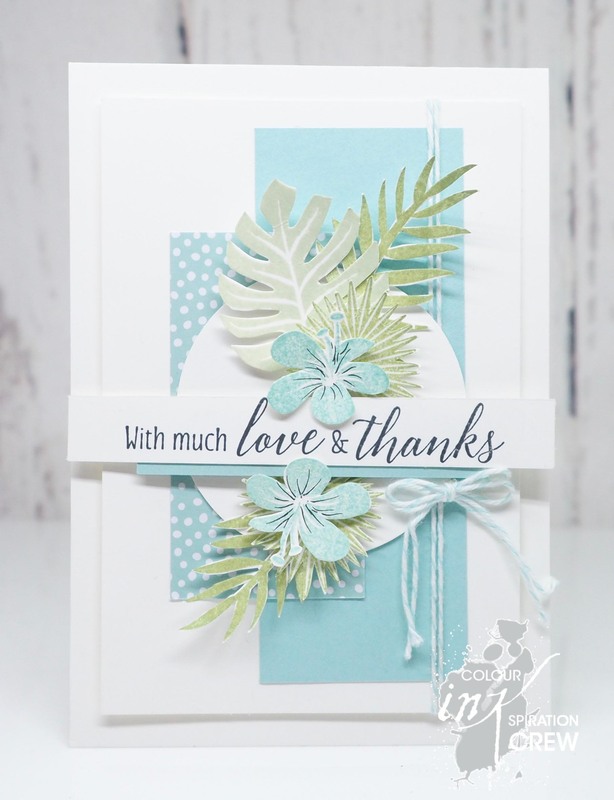 I’ve been wanting to use this fabulous sentiment from Tropical Chic for a while. The layout I’ve used gave me the opportunity to fit the sentiment on my card. Under my sentiment I layered a strip of Sahara Sand DSP from 6″x6″ Neutrals DSP Stack and a strip of Sahara Sand Cardstock. I then used a spotted piece of the same DSP for the background. These 6″ x 6″ stacks are my go to for DSP as the patterns on them work so well when combining the same colours as I’ve done here. As I’m the last person on the hop, you can now head over to our facebook group and see what everyone else is creating. We would love it if you’d like to play along with your card or maybe even 3D project. If you’ve just started with me and would like to keep hopping, click on the next button below to take you the start of the hop to my fellow Melbournian, Rachel Palmieri’s blog. She has created a gorgeous project to inspire you. It’s Wednesday so that means a new sketch challenge at Freshly Made Sketches. Our sketch this week has been designed the seriously talented Kim Singdahlsen. 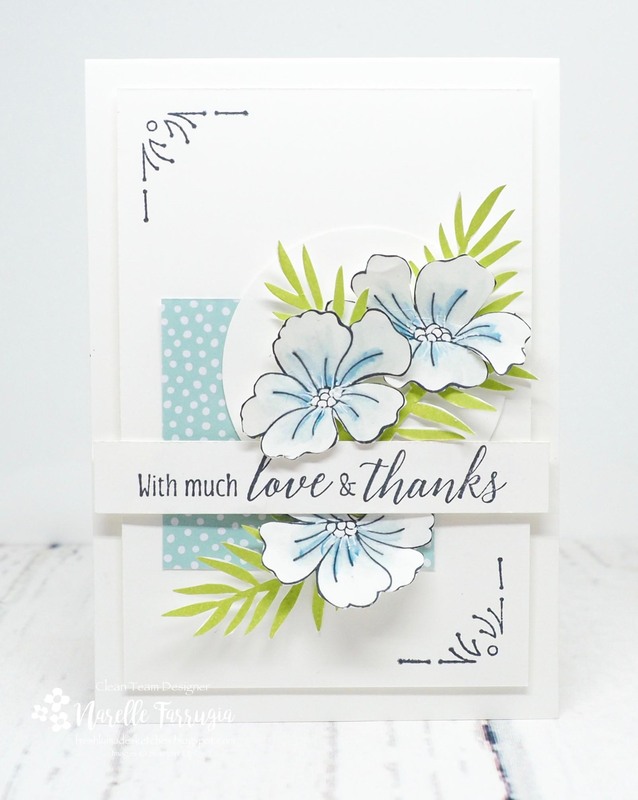 The flowers and leaves from Stampin’ Up!s Tropical Chic are sooooo pretty. I realised I haven’t used them in a little while and thought it was time I inked them up again. I’ve stamped the leaves in a combination of Basic Gray and Pool Party Inks. The little flowers are stamped in Bermuda Bay Ink. The Pool Party designer series paper I’ve used in the background is from Subtles 6″ x 6″ DSP. I’ve added a strip of Basic Gray and Bermuda Bay Cardstock (embossed with my Corrugated Dynamic Textured Impressions Embossing Folder). The sentiment I’ve used is from Love What You Do. The Clean Team have created wonderful cards that will surely inspire you. Head over to the challenge and take a look for yourself. Welcome to another Wednesday! 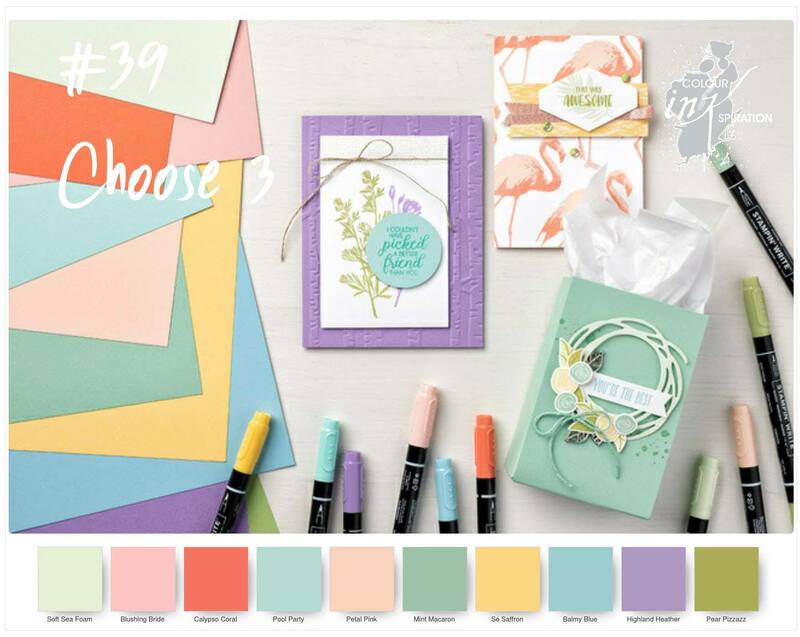 It’s time for a new challenge at Colour INKspiration Challenges and a blog hop! This challenge is a facebook challenge where the design team members choose the top five cards entered and the facebook group get to choose the overall winner. We would love you to play along with our challenge. 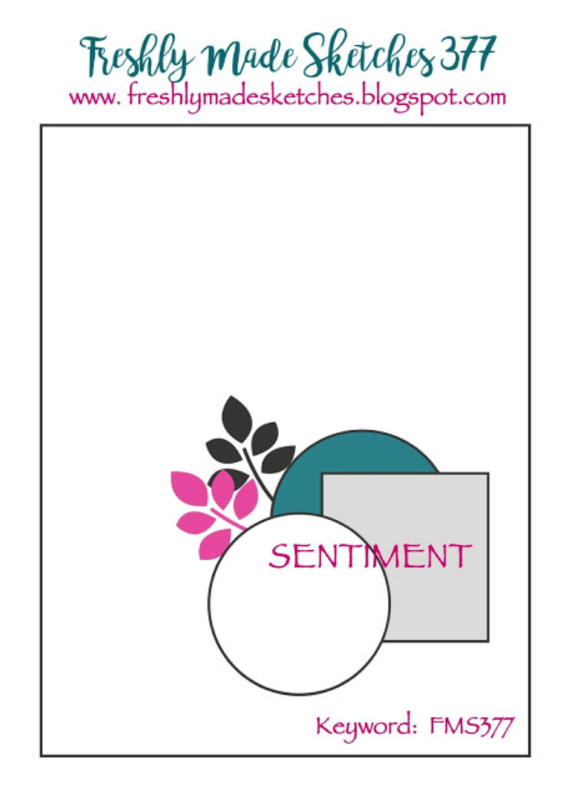 To link up your card and to also check out what everyone is creating, click here. Take a look at our challenge for you this week. 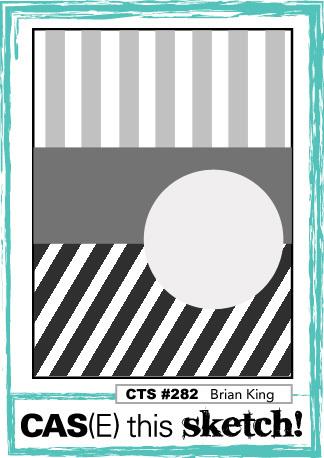 You get to choose three colours for your submission for the challenge from Stampin’ Up! Subtles range. The choices overwhelmed me for about 45 minutes…..I had all sorts of combinations spread out on my desk. After a quick phone call to my mum to distract me, I came up with the idea to use – Pear Pizazz, Soft Sea Foam and Pool Party. I then went about choosing a stamp set – Tropical Chic called out to me for my card. 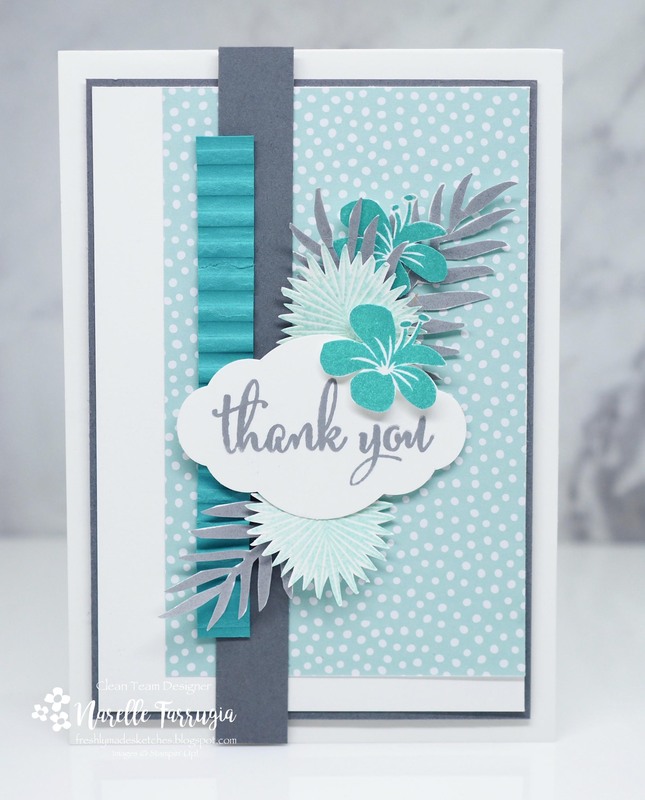 The leaves I’ve stamped and fussy cut are stamped in a combination of Soft Sea Foam and Pear Pizzazz Inks. The pretty little flower is stamped in Pool Party Ink and I’ve added some black definition to the centre of the flowers with my Journalling Pen. I’m in lurve with the sentiment on my card. It fits perfectly across my card and works so well with my habit of layering flowers and leaves above and below it. I’ve used some 6″ x 6″ Subtles Pool Party Designer Series Paper for the panel behind my circle and some Pool Party Cardstock. I then added some Pool Party Bakers Twine to finish off my card – I don’t even know if it needed it, but I couldn’t stop adding to my layers….I don’t think it looks too busy, does it? The next hop along the way is the talented Mel Pagano. Click here or the next button below to take you to her blog. 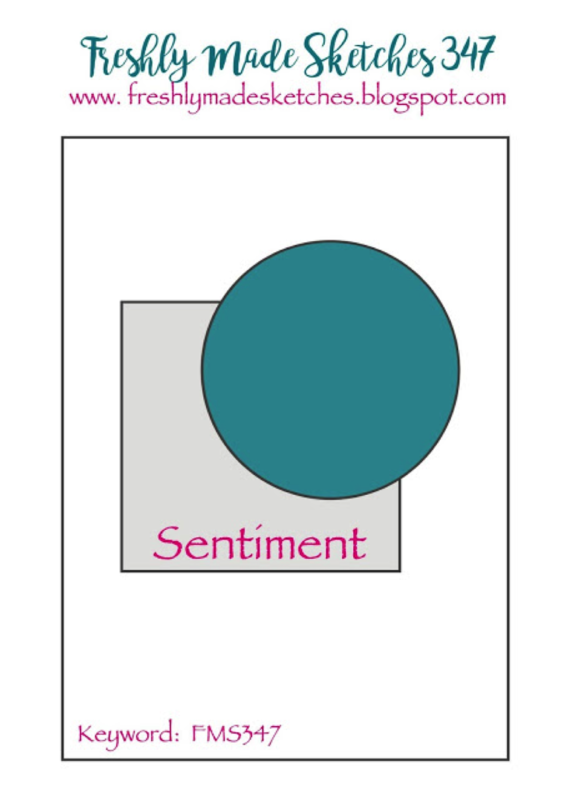 The card I created and am sharing today is for the latest sketch challenge at CAS(E) this Sketch. Here’s their wonderful sketch designed by the uber talented Brian King. I made this card on Sunday but ran out of time to stick everything in it’s place Sunday night as I had to unpack from a long weekend away, so I’ve only managed to upload it here after I finished work today. I LOVE going away, but don’t LOVE unpacking and washing….. Monochromatic was on my mind and this is how I decided to go on my card. The DSP I’ve used in the background is Soft Sea Foam DSP from Subtles 6″ x 6″ Designer Series Paper. For the strip in the centre of my card I used Mossy Meadow and Old Olive Cardstock. 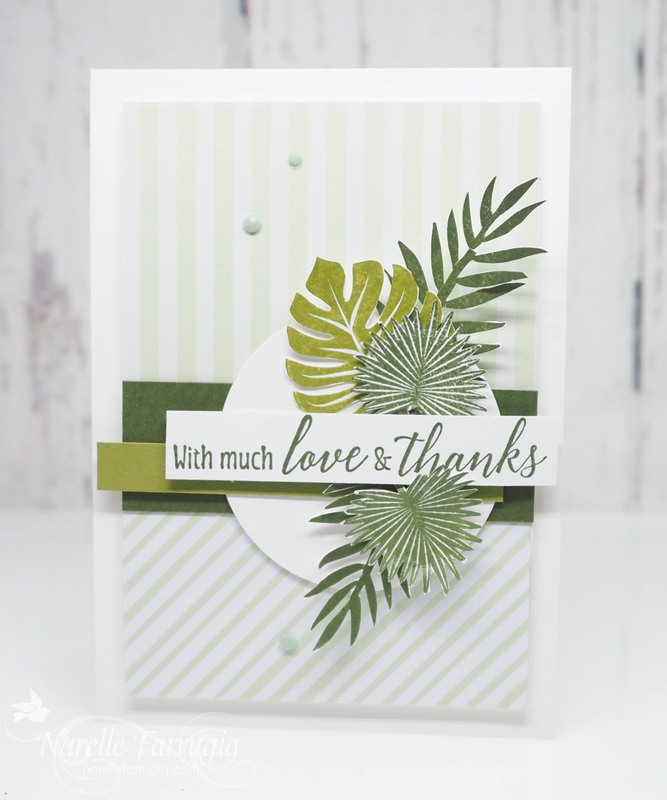 I then stamped these fabulous leaves from Tropical Chic in Mossy Meadow and Old Olive Inks. The sentiment is also from this stamp set and has been stamped in Mossy Meadow Ink. I then added some Faceted Dots – as always I’ve gone with three of them.